Rob Pate owns the former ACME grocery store at Mosby and Venable. 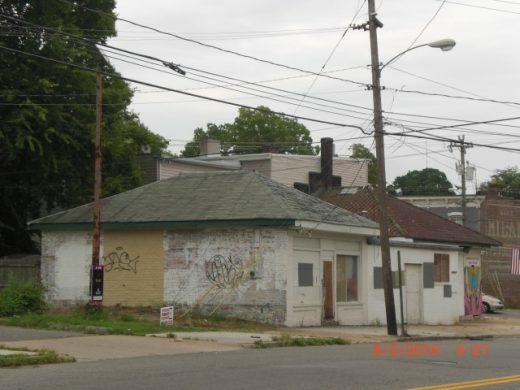 The property consists of 2 addresses – 2000 Venable Street/701 Mosby Street and 707 Mosby Street. Pate is asking the zoning board to allow retail use at the 600 square foot storefront at 707 Mosby Street. 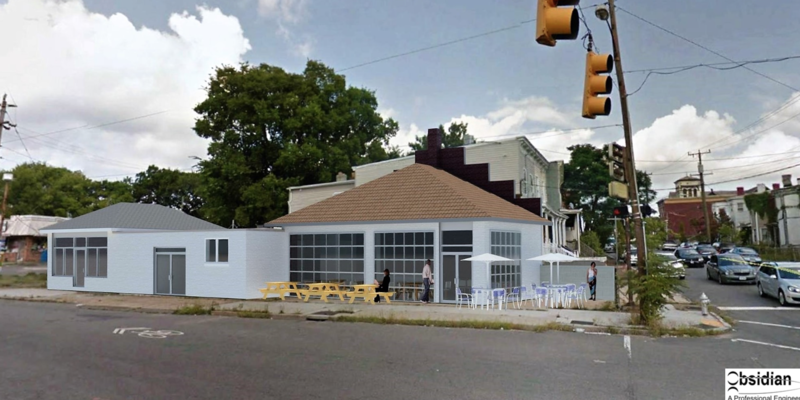 Vacant since a fire in 2009, Pate says prospective tenants have proposed using the storefront as a musical instrument store, an ice cream shop, a grab and go bakery, a custom stationary store, and doughnut shop. 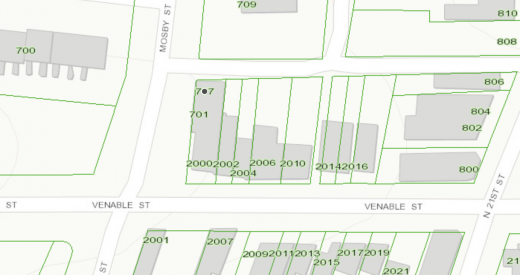 The other, larger parcel at 2000 Venable Street/701 Mosby Street is a 1500 square foot corner store that is zoned R-63, meaning that it can by-right be utilized as a restaurant, convenience store, retail, office, coffee shop or several other things with no parking requirements. I love this property. It has so much potential. I look forward to seeing what transpires. I hope the picture is a hint of what is planned. Thumbs up to rezoning the smaller parcel for retail use with NO off street parking requirements. Rob, are you asking for R63? Or UB zoning classification. God-speed in your endeavors! Awesome. Cool idea. Love the neighborhood this time of year. Loads of good things happening over there. Good luck Rob! Good luck Rob! Totally agree that that back portion should be commercial. Glad to see something put on this lot! Has anyone else noticed that cars are always parked on mosby street (900-1100 block) in the evening between 4-6pm across from the school illegally EVERY DAY? I guess the RPD just doesn’t does have the man power to enforce things like parking violations? Am I loosing something in translation here about 707? That too has always been commercial, built as a barber shop I believe? How can they consider it residential? On a related note, I wonder if Rob Pate has considered requesting a restoration of nonconforming use? Might not work in this case/might not offer enough flexibility, but supposedly it is a much easier/cheaper/quicker process than getting an SUP or Rezoning. @11 ‘L’, thanks for the information. How unfortunate that I see that it is zoned R-63 Residential (Multi-family Urban) but the building is listed as a C02 – Commercial Shell. The property was business as far back as the 1870s at least and the current building has always been a business and only designed as such. I don’t see how there could be any problem having this rezoned? Why would it have changed anyway, especially since it is all business on the opposite corner and street? Thanks to all for the thoughtful comments and questions. I haven’t responded because I plain DID NOT know what zoning was talking about. Still dont, but the board agreed to my request! They had a lively discussion of what was going on with the property zoning and it seems it should never have been rezoned as r-63. Letters were mailed to all owner’s addresses within 150 feet of the property and no one showed up to speak. (alot of those owners were LLCs and other investor names). Anyway the small storefront is now available for your favorite entrepreneur! Rent (for a solid-seeming) tenant could start as low as $300 a month gradually increasing to $1000 a month as improvements are made and business picks up. I now need to get a building permit and replace some glass! I am excited to see the walls opening up on the larger building for the greenhouse look. Progress being made. Any tenant prospects yet? There’s a sign up, but it’s too small for me to read. Anyone know what it’s gonna be? I have not seen an update about this property or its current tenants? Looks like the Hawk’s BBQ people are there but did not know the business was so lucrative seeing a new Rolls-Royce parked on the sidewalk at the door. @district, we’ll reach out this coming week. been working on the redesign of the site so things are running a little slower than usual around here.